I hand over to 20-year-old-i a little. As I wrote at beginning, the amount of writing is little and the content is also poor at the beginning of the trip. A card supposed to be made today has not been made. I passed through the root of great up and down. 55.4 km on the first day for the time being. Continuing up and down today. I met a boy who wants to go to Japan at a pet shop of a highway. This backpackers is beautiful, but there was a cheeky Aussie. 17-year-old. I started out from Sydney on April 2. Distances proceeding and the amount of diary is small, but they seem to be progressing positively. However, 20-year-old-i came back in Sydney on April 5. There is no bike. My right hand is in a plaster harden. A gambit of the Hollywood movie is to cause a climax in 10 minutes. If this bicycle trip is a movie, the climax came in one minute. 20-year-old-i did not write how these things happened, 40-year-old-I speak for him. 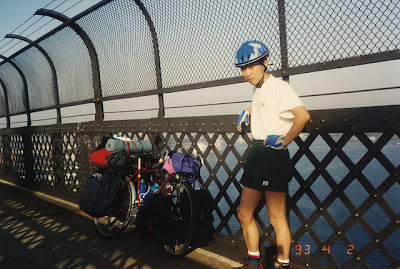 When I started from Sydney, I was riding on a road along the sea at first to avoid the big road. However, Around Sydney was made of bay intricated, I was riding my bike up and down and right and left, so that I no longer know where I am. Sometimes, there is no road at the end. To me who cannot speak English in an era of no Internet-map-app, I wanted to keep at least my direction firmly because there is enough feeling to run flat out. So, in the end, I decided to move and to ride on a big road. I think the weather was good also on April 5. I've been like a bomb on the fast way. About 40 km North from New Castle, there was a road merging to the main road. It is a place like a merging traffic on the highway. To that end, I decided to get into a new shoulder by crossing the road merging in. However, I noticed a large truck of double wagons was coming right behind me. It was a small-sized road train, I think. "It felt like I was dragged for a long time, and I thought I would die at that time"
Somehow, I am pulled from my bike half swallowed. I come out on the road a short distance away. I sit down and am dazed. There was the cushion of the sidebags, but I am bloody because I was dragged. My back is quite bloody in particular. A wound of my left waist was deep, so it left at the waist of 40-year-old-me as a keloid after 20 years. My helmet was broken. In Australia, there was a duty to wear a helmet to ride a bicycle from back then. So, it was right that I bought the helmet at a bicycle shop I found in Sydney. If I do not have a helmet, I would have gone to a world beyond here 20 years earlier than my father did. The frame and wheels of my bike were bent. That's it. The red Japanese bicycle was expensive shopping for me. I farewell it on the third day. It is a bright red bicycle I chose with the bike shop master in the town, but it was a stranger to Australia. I was dazed. The driver is talking something to a police officer. He seems angry. An ambulance came and I was taken to a small hospital as being covered in blood. Even when I am in the ambulance, I am concerned about where my luggage and bicycle are. Then, in the diary, 20-year-old-i wrote "I thought I hated to go back the way you came when I was looking out from the ambulance". At the time, this trip was more important than my life or my life itself, so that it is normal to think like that. I arrived at the hospital, but I do not know what the doctor is saying in English. I waited for a long time and then Mr. Huang who understands Japanese came and interprets. "Where hurts?" "Does it hurt?" Bloody I was asked such questions countless times and taken x-ray. Because it was painful on my right wrist, a gypsum plaster was applied to it. Mr. Huang gave me a hidden information "the doctor does not know if your right hand is broken, but he said to fix it with a plaster for now." There is a plaster attached on my right arm as a quick fix after falling to the left. Is there anything more? There is no place to return for me. This is a foreign country. Still, they said it would better if I returned to Sydney. So, I took a train bound for Sydney with a minimum baggage. The whole body is bloody and covered in scratches and my right arm in the plaster does not move. Mr. Huang saw me off until I got on the train. While stopping many times, the train move towards Sydney slowly. My body and mind are exhausted. Diary on the next day ends like this. "I do not want to even look at a bike now."